The Cuming Museum, Walworth Road, Southwark, London. 10th December, 2010 – 23rd April, 2011. This exhibition combines 50 pairs of historic shoes from the Cuming Museum’s collection with trainers personalised by young people in Southwark who participated in the Visual and Performing Arts Project offered in this area. Mapping is the exhibition’s cornerstone theme, evidenced in the rich variety of maps on printed trainers designed by young people in Southwark, a table map of Southwark that invites visitors to set up markers of sites that are important to them, and a map of the world against which a collection of historic shoes from countries across the planet is displayed. For those who have contributed to this exhibition, then, mobilities has been the lens through which identity has been approached – and what is worn on the feet speaks to the mobilities evoked, both literally and metaphorically. 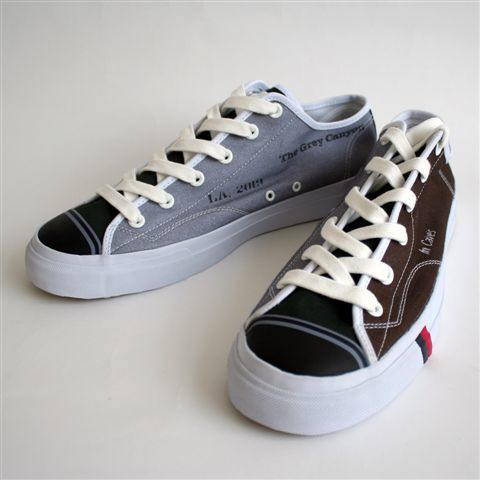 On the trainers designed by young people, the number of a bus route, the London Underground map, an ancient map of the world annotated to show countries visited, a photo of a home street, national flags, and a riddle were among the images printed onto the shoes’ body, seaming and tongue. These as yet unworn shoes, marked with mobilities and belongings recently or currently lived out, sat opposite historic shoes that had travelled across vast distances and eras to their current location. 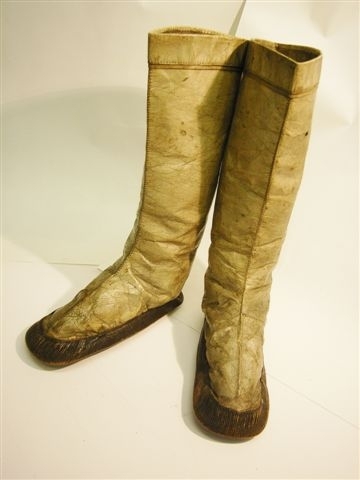 Skin boots that enabled male Inuit hunters to make unbelievable journeys across the north of Canada shared museum space with elegantly decorated slippers worn by women in the 1800s who lived in luxury under the Ottoman Emperor’s regime in Turkey – and never left the confines of the domestic sphere. The short journey up a church aisle that marked the social distance between spinsterhood and marriage was evidenced in a small pair of black patent leather shoes. Worn by 20 year-old Eliza Annie Sanwell in 1893, who herself had migrated from Yorkshire to Camberwell, these shoes reflected the popularity of black toward the end of Queen Victoria’s reign, plus the practicality of dark, shiny leather for a marital journey made on a Boxing Day. In the design of these shoes, then, the mobilities of people from different continents and historical periods were made tangible. The paduka, a wooden sole with only a toe post for attachment to the foot, spoke of the religious journeys and commitment to non-violence of Hindu and Jain sadhus. Narrow stilts on the underside of the paduka restricted contact with the ground and the risk of damage to plant or insect life. In this exhibition, then, the (very) worn was on display opposite the yet-to-be worn. In between lay the table map of the museum’s Southwark location. The diversity of identities could not have been more obvious, yet each shoe spoke of a shared, embodied mobility, lived out somewhere within a single global environment. To visit the Cuming Museum website click here.